What Can You Do with a Large Yard and Landscape in Overlea? Whether it’s a front yard or a back yard, you might be at a loss for what to do with your Overlea landscape. 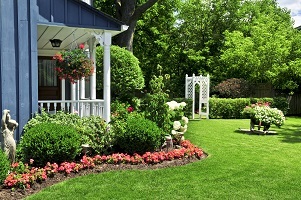 At first, you might be frustrated and confused with what to do when you have a small yard. Luckily for Overlea homeowners, there are plenty of easy solutions to all of your problems making the most of a small landscape. What if you have the opposite problem, and are unsure of what to do with a large landscape? Here are some tips for you. In order to enjoy the beauty of your landscape, you’ll need some place to relax. Why not start that off with a new patio? We offer design consultations on how to bring your your new patio to life. When it comes to making the most of all the space you have, you can’t wrong by installing new hardscape features. Using stones as the base material for your new patio ensures you’ll have a home base from which to enjoy your landscape for years to come. You shouldn’t feel as though you need to stop at just one patio. Go all out and impress your Overlea neighbors. Once you create a few new outdoor living spaces, you’ll be the envy of the neighborhood. Imagine hosting a block party inside your backyard. All you need are some fire pits, gravel pathways, and wide, spacious gardens full of fragrant flowers and beautiful plant. Use hedges to put up small walls where you can put up a hammock for a quiet place to read or relax. If you’re planning on hosting a wedding or a reception in your backyard this summer, then there’s no better place to put down a dance floor and pavilion for refreshments than in your sprawling domain. Sometimes, taking care of larger landscapes can be a time-consuming and money-intensive endeavor. For the Overlea homeowners who are on a tight budget, one possible solution is to use more gravel. Gravel is an affordable way to cover the areas of your lawn where you think you need improved drainage. Alternatively, you could also use gravel to widen the path from your patio to the rest of your yard. This entry was posted on Tuesday, July 31st, 2018 at 10:07 am. Both comments and pings are currently closed.